The two chains with extended pins are mounted in a plastic guide way and driven by the drive unit. The friction force derived between the chain pin and the roller's friction lining conveys the parts. The distances between the rollers have been designed so that shear edges cannot arise and the operator cannot be injured. 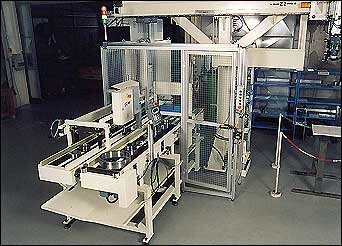 The conveyor is only suitable for parts with large dimensions (for example, from a diameter of 80 mm). The parts create a queue on the conveyor.